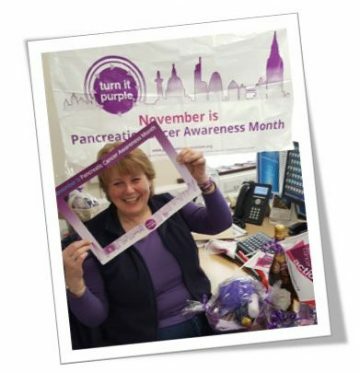 We would like to say a huge thank you to our wonderful Regional rep Jean Keast and her company TH March for Turning it Purple last week to raise awareness of pancreatic cancer! 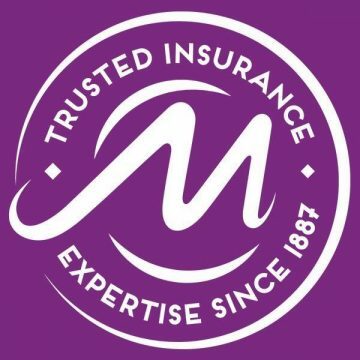 Not only did the team at TH March have a Turn it Purple day at work but they have also changed their company logo purple too! November is the month when the charity Pancreatic Cancer Action and its supporters focus on raising awareness of the killer disease about which levels of understanding and funding for treatment, are very low. The current UK survival rate is only 7%. The charity’s flagship ‘Turn it Purple’ campaign aims to raise consciousness in a fun way by encouraging people, places even landmarks all over the UK to ‘Turn it Purple’. Staff at Chartered Insurance Brokers T H March have joined in enthusiastically to raise funds and awareness led by their work colleague Jean Keast who lost her brother Paul to the disease. 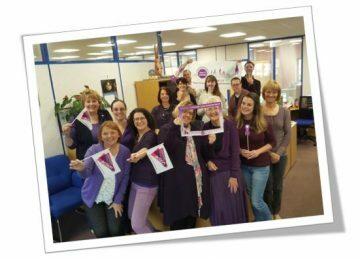 At the company’s National Service Centre in Yelverton, Devon staff have dressed in purple, held raffles with purple prizes and even cooked and sold purple themed food and cakes. Jean said: “I am very grateful to my work colleagues for their ongoing support. Since losing my much-loved brother Paul to this cruel disease I am passionate about helping others to learn, understand and support. Early detection gives patients a fighting chance and funding for more research is urgently needed”. Since she began her fundraising Jean has raised £5774.72 with around another £200 raised this week from her TH March colleagues. Devon and in December there will be more fundraising when Jean has a Christmas tree at her local church’s annual Christmas Tree festival. Her purple themed tree will be dedicated to the memory of those who lost their fight against Pancreatic Cancer.